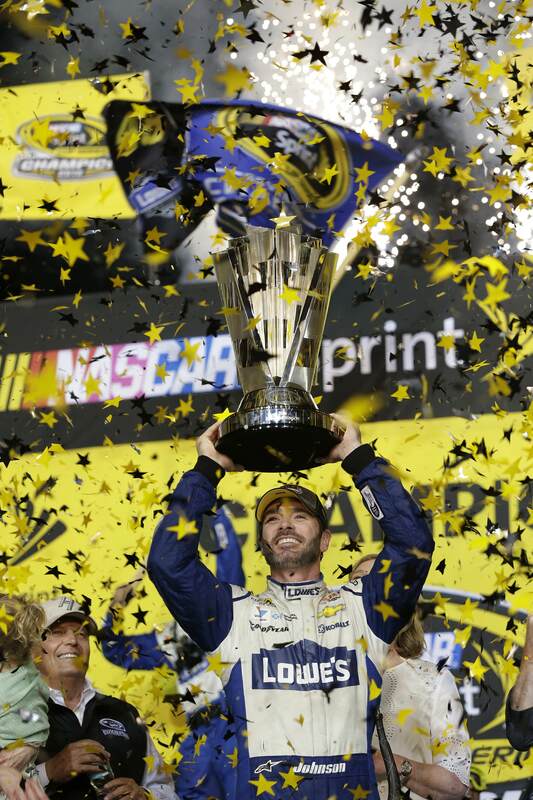 If the word excellence was in a NASCAR dictionary, it’s likely that Jimmie Johnson’s portrait and unmistakable No. 48 Lowe’s Chevrolet Camaro would appear alongside the definition. For the past 16 years, the native of El Cajon, Calif. has blazed his own trail as one of NASCAR’s top racers in nearly meteoric fashion. Certainly, Johnson’s career has been stellar. During his impressive title streak from 2006 through ’10, this former stadium truck racer handily defeated some of the sport’s very best. From Matt Kenseth, Jeff Gordon, Carl Edwards, Mark Martin, and Denny Hamlin, his run at stock car glory was magnificent. Some attribute Johnson’s success to his crew chief Chad Knaus, who’s dubbed one of the geniuses of the NASCAR garage. Naturally, this argument could be supported because all of Johnson’s 83 Cup wins and seven championships have come with Knaus atop his pit box. There’s some who argue that Johnson’s thrived under the playoff format. Then again, drivers of his caliber will find ways to win, no matter the point system, racing package, and aerodynamic configuration of these stock cars. Regardless of where a fan’s stance may preside with Johnson, this competitive and determined racer feels he’s got a lot to prove despite his impressive career numbers. In a year that’s been trying at times, it’s perhaps an occasion like this in which his desire to succeed intensifies. For the past 16 years, Lionel Racing has produced various renditions of Johnson’s No. 48 Chevy rides. During the Consumers Energy 400 race weekend at Michigan International Speedway, I interviewed Johnson to get his take on his career, the changing dynamics at Hendrick Motorsports, and some of his lesser known pranks. Without further ado, let’s do some “Die-Cast Talk” with Jimmie Johnson! Rob Tiongson: You’ve excelled throughout your career as one of the young guns when you started full-time in 2002 to a seven-time Cup champion to this day. How would you say you’ve evolved as a driver from an individual standpoint and a team aspect with Hendrick Motorsports? Jimmie Johnson: I’ve definitely evolved. I can remember back at one point just being so worried about my very limited existence and vantage point of the 48 to the 48 really being a race winning team to a championship winning team. Certainly, once you start winning championships, there’s a responsibility for the organization for the sport that you start to see and understand how you can help the industry. As the championships go by, that space continues to grow. Now, I’m in a position where I have three very young teammates and I get to mentor and coach them. I really do enjoy it. I’ve always had mentors along the way. I enjoy it when those guys ask questions and I can help them. Tiongson: During various points of your career, some fans perceived you as being “too vanilla.” With the advent of social media over the years, would you say it’s dispelled that stereotype about you and has it allowed people to know you a little bit better? Johnson: I totally agree with that. Social has been helpful on that front. I’m just one who’s taken his job very seriously and it’s impossible to make everybody happy or to let everybody truly see who you are and what you’re about. In the limited lens of watching races and trying to get to know somebody off interviews and their workspace is a tough environment. So, social has been very helpful on that front to me. Tiongson: In recent years, you’ve been able to share your experiences in NASCAR with your family. Compared to when your early years in NASCAR to where you are today, has it been more enjoyable to race with your family around? Johnson: It definitely has. I think that everybody has some relational aspect of life that it’s more fun to share life and things with others. To start as a single guy, get married, and now have my two daughters and share these experiences with them – it’s not just the good, but it’s also the tough times, you learn from that. It makes it all more meaningful along the way. Tiongson: You’ve had a plethora of your Cup rides replicated as die-cast cars by Lionel Racing over the years. How humbling is it that fans approach you to autograph these as mementos and have you collected some of these for your office or home as personal keepsakes? Johnson: Over the years, I’ve been able to acquire the prototypes that they come up with. They make only a few prototypes and get approval from everyone. So, I have a large inventory of the original prototypes of those cars and early paint schemes, including my first win car. I do have lot of those cars and it’s cool to hang on to those. Tiongson: You raced Brendan Gaughan throughout your career starting back when you were both kids. Is it true that you used to sign each other’s autographs back then? Do you still do some high jinxes like that to this day? Johnson: We got into a lot of trouble growing up. (laughs) We’re very similar in age. Our parents worked in the industry and they were in the racing side. My dad worked for the tire company and for race teams. Our families loved racing and loved off road racing. In that small industry, traveling through the stadium racing in the winters and desert racing in the summers, there was only so many kids around that were there week after week. Brendan was one and I was the other. Casey Mears would be another to lump into that list as well. We had a lot of fun, and then once we were teens, it turned into more fun/trouble. (laughs) We just had a lot of good years for sure. We did mess around with each other’s autographs. It’s hard to believe but back then, Brendan was pretty skinny! (laughter) We looked more like brothers back then and we could pull that off. Tiongson: We know you’ve got a prowess for racing stock cars, stadium trucks, and cycling. Aside from anything with wheels, what would you consider to be your hidden talent that would surprise people? Johnson: Gosh, I don’t know if I’ve really had any talents. There’s been things that I’ve been passionate about that I’ve obsessed over and found a way to be good at it. So, from a racing standpoint, I was never a standout, but I loved it so much that I kind of developed into it and grew into it. With cycling, I’m not the strongest, fastest guy, but I love it and I’m willing to suffer and put in the time. (laughs) That’s kind of been my arc. Relationships and people are important to me. I guess there is something in that space. When I look at childhood friends, working relationships, relationships with my peers, I think that’s something that’s more of a natural thing for me than the noticeable aspect of my life. Tiongson: You’ve logged 83 wins, 35 poles, and seven championships, accomplishments that will surely earn you a spot in the NASCAR Hall of Fame. What’s been your motivation for constant excellence despite all that you’ve accomplished and experienced in your career? Johnson: I just like challenging myself. In my heart, I’ve always had a sense of what I think I’m capable of and I feel like those have been realistic goals. Of course, you’ve got to shoot for the moon and keep your goals high. There’s just some experience in competing in racing and being on track, regardless of the vehicles, if it was the two wheels growing up, or the four wheels now, there’s just that space that I enjoy. I guess that part isn’t fulfilled or satisfied yet. Some day when it is, I’ll stop racing. That desire is still there now, and I really enjoy competing and being out there.